Jimdo – is an advanced website builder, which encompasses ease-of-use, intuitive nature and affordability. Created in 2007, the system doesn’t stop on the current achievements and keeps improving to provide its users with a perfect web building experience. With over 12 years of expertise, the system can now boast millions of high quality websites with excellent performance. The urge for improvement is one of the most distinctive features of the website builder. Introduction of Jimdo Dolphin is another step to perfection merging with superior performance. The tool has much to offer you now, being the one stop destination for users, who value time and quality above all. Jimdo users have noticed that the website builder has become much more convenient and easy-to-use, not to mention the functionality advancement. This allows creating different website types, including portfolio websites, online stores and landing pages. Jimdo Dolphin has positive effect upon the result. So, let’s test the website builder now to see what is hidden behind it. Easy and impressive web building. Over 12 years of niche expertise. Comes with Jimdo Dolphin AI tool. After completing a basic sign up form, you’ll be offered to choose between two ways of building a website. These are the Classic Jimdo Editor and the advanced Jimdo Dolphin tool. Both options are worth the attention due to their intuitive web building nature, convenience and ease of use. For those users, who intend to launch a more large-scale project, the system is ready to offer classic yet updated Jimdo Creator that comes with an intuitive and well-organized drag-and-drop option. Building and managing a website is very simple here and even a newbie won’t encounter problems, when working on a project. The intuitive WYSIWYG website editor doesn’t require a user to know any programming languages to make things work. Its interface is quite clean and intuitive. Actually, Jimdo interface somewhat resembles those of Weebly and Wix with their separate dashboards where you can manage such things as domains, contributors, SEO and various applications. This is quite convenient and understandable for everyone. The only demerit of the classic Jimdo Editor is that it doesn’t have a preview option. This means that you won’t be able to see the edits you make in progress. Instead, you’ll have to publish a website to watch the result. Another brilliant way to get a ready-made website is to use the new advanced Jimdo Dolphin tool, which has notably simplified the entire web building process. Even an inexperienced user, who has never been involved in website building at all, can create a website in several minutes only. The tool will be of great help to those users, who need standard business websites or one-page projects. This is very simple as the system will automatically generate a personalized website for you based on the answers to the provided business-related questions. You’ll be initially asked to choose the type of a website you need (either personal or business). Right after that, you’ll have to make up your website name, by using which the system will search for the available business-related information on the web. If you have a Facebook account, you’ll be offered to connect it to your website so that the service could use the data, when building a website for you. Apart from that, you’ll be offered to select the industry you specialize in. The choice will affect the collection of niche-specific website templates you’ll need to choose from. Uploading a logo is the next step that will make your website more personalized, representing your brand. An interesting option is the one that allows connecting your Instagram account (if any) to the website to give it your brand-specific features. The final step is to select the style you’d like your website to be created in and the domain name. That’s it – Jimdo Dolphin will take care of the rest! In just a few seconds, you’ll see your ready made website with content provided by default. It is up to you to replace it with that of your own (if you have such a desire), add photos and other content you’d like to be displayed on your website. The entire process won’t take it longer than half an hour, but the result will certainly impress you. Your website will have modern design, providing the required information all in one place. Just try this option to make sure that building a website has never been simpler before! Intuitive, easy and quick web design process. When it comes down to the basics, Jimdo is similar to its competitors – it allows users to customize ready made templates using in-built editing tools and widgets. As for the bells and whistles, I’d like to point out their blogging and eCommerce capabilities. With Jimdo you can create dynamic blog posts offering various user interactions: file download (FYI: you can enable synchronization with your Dropbox account), custom widget/HTML, form, Google Maps, flash animation (.swf files), responsive blog designs, sorting out the posts by tags and categories, advanced SEO settings for each post and more. You can create drafts, but there’s no scheduled posting here. There is no need to create a separate blog, if you need the one – it already comes with your website and you just need to turn it on during the web design process. This is how you’ll get a well-customized blog integrated into your website. Once it is activated, start writing the posts and adding photos, videos and other content. For all those users willing to launch a blog, Jimdo offers a convenient post editing tool that can be used to add new modules. Due to it, you can integrate all the content from your Jimdo website directly to the posts, whether this is text, image galleries, videos, widgets or even products from your online store. This is a unique feature for website builders. Finally, go ahead to share your posts online! Starting your own blog – a detailed step-by-step guide how to launch and manage your own blog on a professional level. Jimdo’s eCommerce is also highly customizable. There are tons of properties to configure here: product display, tax (you can set an individual tax rate for each product), item availability, shipping costs and time description, Stripe and PayPal account connection, cancellation and return policies, custom salutation and email confirmation/completed checkout messages etc. For those users, who dream of simple yet effective eCommerce website building experience, Jimdo offers a set of click-to-edit tools, unique and customizable eCommerce templates, shipping customization, advanced SEO tools for effective web store promotion and even email order templates to simplify the ordering process for clients. Launching an eCommerce website with Jimdo takes a couple of minutes only, while managing it won’t take much effort and time as well. You’ll learn how to customize shipping expenses, create discount codes, track the inventory list and other nuances during the web creation process. Jimdo also offers a free app for iOS and Android that allows managing your online store on the go. That’s really convenient and simple! Building an eCommerce website from zero – a complete tutorial of the online store creation for beginners. Jimdo is SEO optimized right from the start, but the system developers try their best effort to introduce more advanced tools that make it possible to boost your website search engine results. Users can add and edit meta tags (titles, descriptions) and adjust custom page URLs. 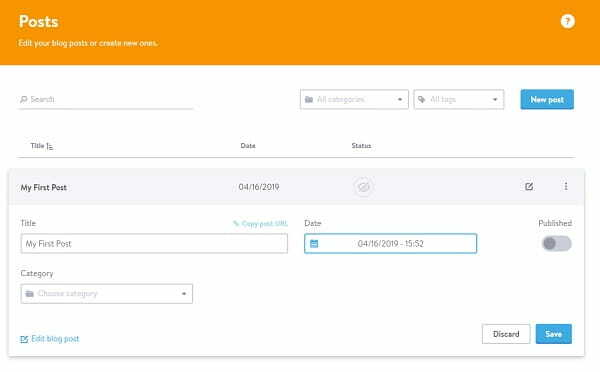 JimdoPro and JimdoBusiness users can override the automatically generated page names and specify the exact URL of a page (I wish that was possible for all users). What’s more, the owners of Business and Platinum packages have access to advanced SEO settings like robots meta tags (noindex, nofollow, and noopener). They allow controlling the interaction of the search engines with website pages. Finally, Jimdo supports URL redirects and helps beginners perform basic SEO modifications with the help of the RankingCoach add-on. Classic Jimdo interface currently supports eight languages, while the editor itself supports any language of your choice. 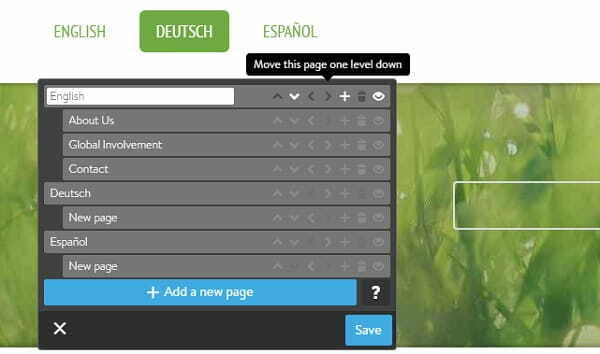 It’s possible to create multilingual websites here, but this will take some effort and time. The website builder doesn’t have an integrated app store, but it allows integrating some third-party services like Eventbrite ticketing, Tidio Live Chat, Infogr.am infographics, social media platforms and more. YouTube video embedding and rich photo galleries available in stock contribute to the ease of the web design process. Jimdo allows connecting Google Analytics into your ready-made website to gather the detailed statistics about the project and its performance. It will give you better understanding of your visitors’ behaviour, the locations they come from, website features they are interested in most of all, sales and conversion rates, visitor trends during certain periods, the amount of time users spend at different website pages, the percentage of regular visitors and newcomers etc. If you wish, you can protect the entire website or its separate pages with passwords. The strength and type of protection depends upon the Jimdo plan you will go for, but it is quite possible to make up several password-protected pages with individual passwords here. All Jimdo websites are securely encrypted with reliable SSL Certificates. This matters a lot for all kinds of projects, including online stores. The Certificates encrypt all information sent to and from the website, which is especially important for websites accepting credit card payments. Jimdo Dolphin interface is simple, user-friendly and pleasant. There is nothing that will distract your attention here – all the elements are on their places. The system is not overwhelmed with extra questions, details and windows. This is right what beginners need and value most of all. As to the complexity of the feature set, Jimdo Dolphin is impressingly simple and convenient. You initially get access to the screen, where you will see a kind of a “questionnaire” about your business. You’ll be required to submit your business information, provide social network accounts, contact info etc. The system, which comes with the integrated AI tool, will analyze the submitted data to further select the most suitable design and create a website for you in just a couple of minutes. What you’ll have to do next is to replace the available photos with those of your own, add text and media files as well as check the information you’ve initially provided. This doesn’t take much time yet ensures decent result. Mind that Dolphin websites are block-based. To customize a website, you should add new blocks, replace them and adjust their positions, copy and delete them to form the required layout. The list of the available block types is as follows: cover, about, text, image, columns, list, music, contact. Each category contains around a dozen of block design variants. To edit the content, you should just click the element. You will get a set of modification options depending upon its type, be it a text editor, an image choice menu, a option allowing to add a link, video or music tracks. Each block has its settings, which make it possible to select the set of the displayed elements (buttons, text, logo, photo/video, social bar etc.). It’s important to mention the high speed of working with the editor – the process is really smooth and there are no interface response delays. We also liked the fonts the system offers – they perfectly fit the conceptions of the websites created. By using the mobile Jimdo Boost application, you can get detailed website traffic data (users visiting your website, their location and the number of views) and useful recommendations on the effective website promotion. The design looks appealing. The data are loaded from Google Analytics. Stunning speed and simplicity of website building. Jimdo offers over 30 customizable and pre-designed templates used both for websites created with Jimdo Dolphin and for those launched with a standard website editor. Each new template comes in numerous pre-styled variations. Users, who are going to work with Jimdo Creator, have broader design customization options. They may browse through a variety of templates for different types of websites, including blogs, online stores, portfolios, businesses etc. This, however, does not mean that you can use these templates exclusively for building these types of websites. You can take any of them and customize it with regard to your web design needs. When customizing your site’s look, you’ll notice the “Style by Element” toggle. The toggle lets you choose between applying changes to a single element or to all the elements of that type throughout the website. This powerful toggle helps you avoid lots of manual work. All the templates the system offers are responsive and can be changed during the web design process without the risk to lose the content you’ve already submitted. What’s more, if you know a thing or two about coding, you can create a unique template for your Jimdo site using their Custom Template Interface (HTML/CSS editor + file manager). This is a unique feature most website builders cannot boast. Jimdo Dolphin does not offer a standard template selection procedure. After you get access to the wizard and answer the major questions the system generates for you (including the type and style of the website you prefer), you will be offered a template chosen by the system specifically for your website. You’ll have to replace the available content with that of your own, upload the logo, images, media files and then publish the ready-made project. Customization of websites created with Dolphin takes a few minutes only as the system is meant for newbies, who don’t know much about website design and, thus, don’t need intricate customization tools. 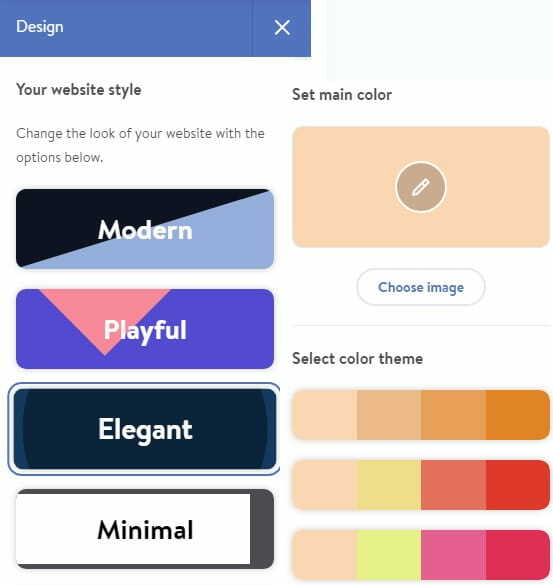 In most cases, users may experiment with content, color schemes, styles and backgrounds, without exploring deep customization options of the system. It’s interesting to point out that AI selects the website colour palette depending upon the color scheme of the uploaded logo and photos. If you wish, you can change the colours manually in the editor, having chosen one of the dozen presets. Websites created both with classic Jimdo and Dolphin are optimized for mobile viewing by default. Whatever mobile device your client will use to browse the website, it will automatically adapt to its screen size, resolution and scripting abilities without the need to change something or create a separate mobile version of your website. Responsive designs give your websites trendy look and advanced functionality. Responsive designs provided by default. Automated template choice by Jimdo Dolphin. Jimdo has an excellent Support Center offering various forms of support, from basic tutorials to live chat. Their knowledge base is rather handy and easy-to-navigate. I also like its simple language. For the convenience of users, all the questions and topics available in the knowledge base are subdivided into thematic categories, including Basics, Design, Domains and Email, Blogging, Store, Search Engine Optimization, Account and FAQ. There is a search filter option that simplifies the search of the required information. You can also watch a video tutorial to find out how to build a Jimdo website from scratch. The website builder has its own YouTube channel with lots of videos that tackle the nuances of working with the system. The channel is regularly updated with new video tutorials to help you get started easily. Customer support priority depends upon the plan a user is subscribed to. There is no customer support for free account users. Pro account users are provided with Pro support offered by the native English speakers working for the system in 1-2 days after they leave a request. The Support Team answers all the questions in person and works in coordination with a user to find the best solution to the problem. Business and Premium account users are offered exclusive Premium support, getting the reply from the native English speakers within 2-4 hours on business days after the request is made. Similar to other website builders, Jimdo offers a free basic account allowing you to see how the service works. Apart from getting the basic system features, you will also avail 500 MB of disk space, 2GB of bandwidth, HTTPS encryption and the subdomain. You can also display and sell up to 5 items within this plan. In order to connect your own domain as well as to unlock more features and increase storage, you have to purchase either a Pro ($10/mo), Business ($20/mo), SEO Plus ($30/mo) or Platinum ($40/mo) plans. 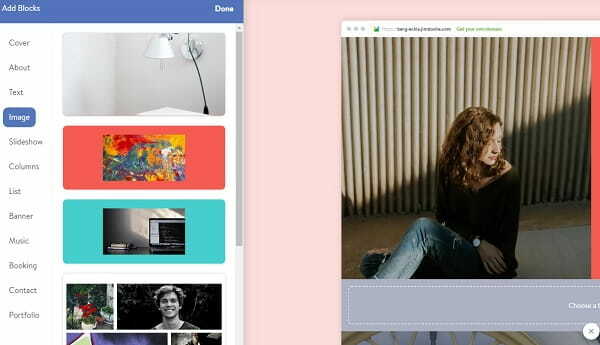 Pro Plan is a nice choice for creatives, freelancers and bloggers, who don’t have enough web building experience to create full-featured websites on their own. Business Plan works best for entrepreneurs and web store owners. SEO Plus subscription will be a good choice for those users, who are concerned about their websites’ Google search engine ranking, while the advanced Platinum Plan proves to be the ultimate solution for a professional website or an online store. All Jimdo plans (including a free one) have a blogging option, professional templates, integrated social media tools, mobile optimization, video embedding option, HTTPS encryption, image galleries. They allow adding Google maps, contact forms and change website’s code – a pretty standard set for a modern website builder. There is nothing extra to surprise. If you are planning to use Jimdo Dolphin for the completion of serious web building tasks, then a free Play plan with its restrictions won’t work well for you. Instead, it makes sense to upgrade to one of the paid plans the system offers. Thus, you can choose from Start ($9/mo), Grow ($15/mo), eCommerce ($19/mo) or Unlimited ($39/mo) plans that are billed annually. ✓ 5 forwarding email addresses. The Start Plan works best for personal or creative projects. The Grow Plan is a better choice for companies and entrepreneurs, who need professional websites. The eCommerce Plan is, obviously, great for launching online stores, while the Unlimited Plan is an ultimate solution for building all types of websites that require a complete toolset. All the plans are ad-free and offer a free domain for the first year of use, email address connection, unlimited disk space and bandwidth, HTTPS encryption, website statistics. Rich feature set included into each subscription. Jimdo is a simple yet effective and high quality website builder. Just like any other system, it has its advantages and disadvantages that affect the web building experience you may get when using the service. Let’s have a closer look now at the major pros and cons the system has. ✔ You can start building a website even without registering with the system. ✔ Ease-of-use, functionality and convenience for everyone. ✔ Two ways to create a website – Standard Editor and Jimdo Dolphin. ✔ Powerful Customer Support Center. ✔ Blogging and eCommerce engines. ✘ Lack of template flexibility. ✘ Insufficient user management options. Jimdo is undoubtedly a quality website builder, which is in demand with newbies and web design pros. Its Standard and Dolphin editors allow for diverse degree of website customization and come up to various users’ needs. At the same time, there are website builders that can cope with some of the tasks much better than Jimdo. Just have a look at the detailed comparisons of Jimdo with its major competitors to understand what I mean. The choice of the most suitable website builder may depend upon multiple factors – just take your time to pick the service that works best for your specific web design needs. Jimdo was initially created with the only purpose in mind – to create pleasant, easy and convenient web building environment for all categories of users, irrespective of their skills and expertise rate. This is an established website builder that powers around 20 millions of websites from nearly every country on the planet. It has decent blogging and eCommerce platforms. It’s suitable for creating personal blogs, corporate sites, web stores and other projects. If you intend to create a simple promo website with a standard feature set, then the advanced Jimdo Dolphin tool is the best choice for you. This is the simplified version of the website builder, which allows building any website you need in less than 5 minutes. Just answer the questions, connect your social media accounts, follow the guidelines and let the system take care of the rest! What you get is a fully-customized website with your own content. In case you have the idea to launch a blog or an online store, you won’t go without using a classic website editor with powerful functionality. Jimdo Creator helps you build a website with no hassle at all. You’ll be offered a set of templates, design customization tools, features and settings needed to give your website the required design and performance, enjoying the creative and fun web building process. If I could change anything about Jimdo, I would certainly add user management options as well as the ability to add multiple contributors. Besides, I would divide the whole admin panel into two sections: design area and content area. And what are your thoughts?